I’m going to sing you in my verses. A swing that makes you sway. Return I will to old Brazil. Composer Ary Barroso (born November 7, 1903 in Ubá, Minas Gerais and died February 9, 1964 in Rio de Janeiro) Aquarela do Brasil is his best known composition. In the 1920s and '30s, Barroso revamped the Brazilian samba, making it more accessible to international audiences, and was one of Carmen Miranda's favorite songwriters. “Aquarela do Brasil” was first performed in the theatrical revue Entra na Faixa on 16 June 1939 by the popular singer Araci Cortes with little fanfare. However it was not long before many were clamoring for the right to record it. The foremost living Ary Barroso interpreter is, João Gilberto, who has given many of Barroso's tunes a new life and whose recordings of “Aquarela do Brasil” are widely acclaimed. 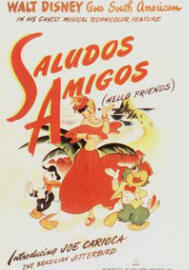 "Aquarela" competed for the Oscar for Best Song as part of the musical score of Disney's 1943 film, Saludos, Amigos (Alô, Amigos in Brazil). He was asked to spend a spell in Hollywood to write music for a new film that would be called Brazil. On the 31st of December, 1944, Ary Barroso received the Merit Award of the Academy of Motion Pictures and Sciences for the samba "Rio de Janeiro," from the musical score of the film Brazil. 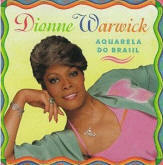 In November 1997 Aquarela do Brasil was voted Best Brazilian Song of the Century by a jury of thirteen experts assembled by the Brazilian Academy of Letters. Ary Barroso's lived life large as a carioca in the public eye. Newspaper columnist, color commentator for his beloved Flamengo soccer team and a TV personality. His most memorable moments on TV came when he terrorized stardom candidates on the Star Search like Calouros em Desfile program. Elza Soares, dirt poor, was introduced on the show. Very skinny, and disheveled, with a borrowed dress much larger than she was, Ary teased her: "What planet are you from?" She, without embarrassment: "Planet Hungry, Ary". She sung, shined, and still managed an unprecedented victory as Ary always respected talent. Ary was one of the first passionate color commentators, quick to interview players and shamelessly root for his beloved Flamengo. He played his harmonica, which was his trademark whenever there was a goal. It was the Carnaval night of February 9th, 1964 as well as the eve of the last military coup; Império Serrano samba school was entering the avenue, with the theme "Aquarela do Brasil", in homage to the great composer. Only they paraded in mourning and late. They started at 10:00 p.m. At 9:50 a telephone message let them know that Ary had just been struck by a heart attack. "Aquarela do Brasil" ("Watercolor of Brazil", also known in the English-speaking countries simply as "Brazil") is called the unofficial anthem of Brazil. It will long continue to remain among the most noted of Brazilian patriotic songs. This song marked the creation of a new genre, the Samba-exaltação (Exaltation Samba), which was adopted by the nationalist dictatorship of Getúlio Vargas. With the rise of the Estado Novo, (New State) centralizing efforts accelerated with a government's quest for shared national identity and the selection of Afro-Brazilian culture as a critical component. With the passing of the Old Republic, too long controlled by entrenched powerful Sao Paulo coffee oligarchs, the new president Vargas became convinced that radio and live music programmers should give priority to Brazilian performers and a new national identity. The national government lent strong support to an informal alliance dedicated to "a new Brazil" with a broad if vague vision of modernization and promoting industry. The Vargas government established the DIP—Department of Press and Propaganda. "Its function is not just to supervise broadcasting in the country, but to also guide Brazilian radio in its cultural, social, and political activities". The 1920s had brought the music recording industry to the forefront, just as the samba rhythm was reaching a across class lines and beginning to capture the spirit of the Carioca carnaval. The samba musical genre, at first identified strongly with the black population of Rio de Janeiro was in the process of becoming inseparable as a mixture of music and dance, conceptually a powerful unifying symbol of Brazil for Brazilians. Samba musically began as responsorial singing that cultivates the call-and-response performing style, and percussive interplay, or the batucada. That samba was able to captivate the cariocas, the cultural arbiters for the entire country was a powerful force in its rise to dominance. General Getulio Vargas (1930-1937), and during his "Estado Novo" military dictatorship (1937-1945, heralded the development of samba as a unifying element of Brazilian culture. Typical of samba exaltação it is characterized lyrically by romantic patriotism and musically by long involved melodies and arrangements keeping the North American big-band sound. In 1939, "Aquarela do Brasil" won first prize in a popular music contest sponsored by—guess—the DIP which will forever stand as the greatest symbol of samba exaltação. Indeed it was a indulgence of most popular music during that period, American and French included, to praise national glories. This was particularly true of dictators as both Hitler in Germany and Mussolini in Italy, relied heavily on nationalism to solidify their place in the government. According to Bruce Gilman " If the Brazilian's boasting seemed to be more pronounced, it was possibly because Ary Barroso's "Aquarela do Brasil" is a much better tune than Irving Berlin's "God Bless America." Carmen Miranda had been extolling the wonders of everything Brazilian well before the 1937 dictatorship of Vargas and his Estado Novo movement. Her meteoric career rise to the top carried this same theme of praise for the land that we love to all segments of Brazilian society. Her Brazilian character would eventually became a prized part of the culture and what it means to be Brazilian. "Carmen Miranda not only translated the black samba for a white audience, originated the Brazilian way of singing, and instigated the new standard of performance practice for Brazilian popular music; she defined the Carioca woman.
" The Brazilian women who opened the twentieth century were delicate, susceptible, squeamish, always well dressed, and always fleeing from men. Carmen created the seductive image of the Brazilian woman who meet men joyously, legs and cleavage showing. " The famous Carmen Miranda phrase "bananas is my business" comes from a self-mocking response to her critics she did in the 1940s, to address the perception of being stereotyped. Carmen's show business career did suffer from her archetypal creation of a persona which became inseparable from both her screen identity and public persona. It's lack of depth was a source of resentment by Latin America women as the power of her image came to represent all Latin American woman as a comical icon of fertility and friendliness that threatened no one. Unlike Madonna whose implacable show business sense during the 80's & 90's allowed her to recreate her image several times under the gaze of the world, Carmen Miranda became depressed as her star began its descent. 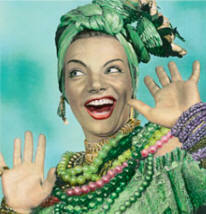 Carmen Miranda's early death at the age of 46 cements her now classic memories into our shared consciousness. The role of creating a new more complete and complex image of Latin American women has fallen to the generations to come in the 21st century. Today thousands of electrifying samba girls performing in Brazilian dance troupes throughout the world take the stage with an altogether different attitude than professional female pole dancers. the story of Carmen Miranda. With their smiles, accent on their womanly charms and choreography they are holding up the ideal of joyful living in the present, demanding equality on their own terms where beauty and hard work are rewarded, and advancing a society that respects the rising power of the sacred feminine. "Smile of happiness, just because the music sounds so good, so calm, so quiet, and at the same time so vibrant, so loud, so clear, so real... And isn't that what makes us feel good?" Luisão surprises with his magic and involving voice, the control of the Portuguese language, and also by having a very personal style. While in concert, his best companion is his guitar, which he compares to his latest love affairs, with the sole difference that she’ll never let him down. Aquarela do Brasil from Disney's classic film "Saludos Amigos"
Saludos Amigos is a 1942 animated film produced by Walt Disney Productions set in Latin America ands made up of four different segments. 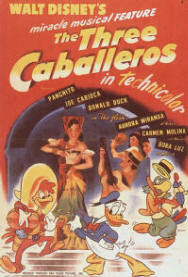 Although a short 42 minutes Saludos Amigos was the first Disney cartoon movie to earn a sequel, The Three Caballeros, produced two years later. 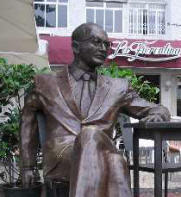 The film premiered in Rio de Janeiro on August 24, 1942. It was released in the United States on February 6, 1943. Aquarela do Brasil (or "Watercolor of Brazil"), the finale of the film, involved a brand-new character, José Carioca, showing Donald Duck around South America and introduce him to the samba (to the tunes of "Brazil" and "Tico Tico"). The United States Department of State commissioned this movie during World War II to be shown in Central and South America to build up relations with the Latin American populace. Several governments including Argentina had close ties with Nazi Germany and the most popular US figure there was Mickey Mouse. “Aquarela do Brasil” was performed in Portuguese by Aloysio de Oliveira, founder of the pioneer vocal-instrumental group Bando da Lua, musical director for Carmen Miranda, and later the most important bossa-nova recording mogul in Brazil. 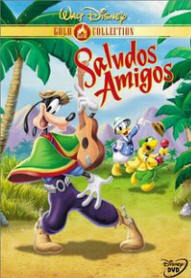 2000 DVD cover of Saludos Amigos. There is actually a set of dances, rather than a single dance, that define the Samba dancing scene in the country; thus, no one dance can be claimed with certainty as the "original" Samba style.. In Brazil, the form of Samba is more of a single person dance. "Samba no pé" is a solo dance that is most often danced impromptu when samba music is played. The basic movement involves a straight body and a bending of one knee at a time. The feet move very slightly - only a few inches at a time. The rhythm is 2/4, with 3 steps per measure. It can be described calling it and-a-one, and-a-two, then back to one. The basic movement is the same to either side, where one foot moves to the outside lifting up just before the first beat, lifting on the "and-a" and replacing itself on the floor on the one beat (i.e. the right leg moves slightly to the right) and this leg is kept straight. The other foot moves slightly towards the front, and closer to the first foot. The second leg bends slightly at the knee so that the left side of the hip lowers and the right side appears to move higher. The weight is shifted to this inside foot briefly for the next "and-a", then shifted back to the outside foot on the "two", and the same series of actions is repeated towards the other side. Samba is counted in 2/4 time (2 beats to a bar of music). The only important thing to remember is that the dance is done in triple time - meaning, three steps are performed in two beats. Aquarela do Brasil has been successful through the years and has been played in many different styles, from a capella to orchestral arrangements. 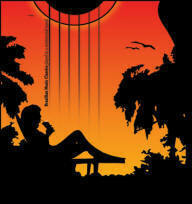 It has been covered by many artists, including João Gilberto, Gal Costa, The Coasters, Chick Corea, Juan García Esquivel, Xavier Cugat, Chet Atkins, Django Reinhardt, Chris de Burgh, Frank Sinatra, Toquinho, Tom Jobim, Kate Bush (for Brazil (film), though the main title version of the song was performed by Geoff Muldaur) Arcade Fire, Cornelius, The Vengaboys, Johnny Mathis, Rossa Passos, Pink Martini, and Guster. The Ritchie Family recorded a vaguely related version in the age of disco; the core tune is partially preserved, but the lyrics are completely different. The wikipedia article on samba identifies many different types of samba music. Most familiar are the sambas de enredo, the theme songs of Rio's Carnival parades which feature the large percussion sections or batucadas marching with hundreds of singers and dancers in escolas de samba or samba schools. However, most recordings feature the samba-cancão or samba-song, best represented by prominent singers from the samba schools like Martinho Da Vila, Beth Carvalho, Paulinho da Viola, Clara Nunes and others, who record in the studio with the same percussion instruments (but fewer!) and add other instrumentation like a seven-string guitar, a ukelele-like cavaquinho and, in general, employ more sophisticated arrangements.